Seche Restore Thinner is the only thinner which may be used to thin a bottle of Seche Vite; no other thinner may be used to thin Seche Vite. Seche Vite is a dry fast top coat and will thicken, which must be assumed. Seche Restore is the only way to return a bottle of Seche Vite to its original consistency. It may also be used to restore any other nail lacquer product whether one produced by Seche or any other brand. 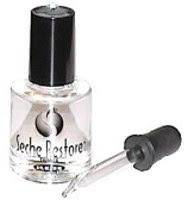 Seche Restore is the only product on the market today which will effectively restore a bottle of polish. Seche Restore will not diminish shine or dull colours and only replaces those ingredients which have evaporated from the bottle of Seche Vite or other nail lacquers. Use by adding a few drops until consistency is fully restored.